Ah, sweet, sweet Firenze. This city is nothing short of magical. The history, the art, the smooth Italian charm. And of course, the food. My goodness, the food. So so good. But most of it is far from the diet I usually consume. I wanted to soak in all the sweetness of the “dolce vita” that’s so rich in Florence, but I also wanted to honor my body and fuel it well. These cute little spots were my saving grace amidst all the indulgence of the city. Carduccio is tucked down a quiet alleyway just off the main piazza of the Palazzo Pitti. The space is quaint, with a modern artsy feel inside a vintage structure. It’s definitely a fun spot for health-seeking locals, not a cafe loaded with tourists. Entirely organic and farm-to-table, the menu is actually pretty extensive for a small little place: cold-pressed juices, coffee, smoothies and smoothie bowls, quiches, a few sandwiches, and a lot of salads. Both times I went for breakfast so I never got to try any of the salads (the Power Bowl with quinoa, cauliflower, beet, carrots, cashews and ginger sounded amazing) but the smoothie bowls were great. I definitely loved the Protein Bowl with raw cacao, almonds, banana, chia seeds, hemp seeds and rice milk (but I actually subbed coconut milk). With free wifi, it was the perfect spot to sit and work for a couple hours with a bowl and a coffee. Ciro & Sons was on my list long before I left. I had read that they won the “World Championship of Gluten Free Pizza” so I specifically waited to have any pizza until I got my hands on theirs. The whole first page of their menu is dedicated to the details of their celiac-friendly kitchen. I ordered mozzarella, prosciutto, Parmesan, and arugula. I can’t say it was the best I’ve ever had (I will literally dream of Il Fornillo in Positano until the day I go back to that glorious place). But it was darn good and so nice to know it was truly free of gluten. Another spot I knew I had to visit, Ristorante Quinoa is a 100% gluten free restaurant. And in the heart of Pastaland, it’s an oasis for celiacs. They’ve got a super cute courtyard inside a cool old building, and it was such an enjoyable experience just to sit in the shade and enjoy a meal. They immediately brought me gluten free bread and a massive menu of “senza glutine” options. I was tempted to try all the fun Thai noodles and pasta dishes, but my body was screaming for some vegetables and healthy fats, so I went with this simple summer salad. And it was perfect. Shake Cafe is a sweet little juice bar. They offer lots of vegan and vegetarian friendly options: juices, smoothies, coffees, toasts, sandwiches, salads and a few baked treats. I actually visited 2 different times. The first was for breakfast, and I ordered an iced almond milk matcha latte with a smoothie bowl. The second was for lunch, so I ordered this quinoa power salad. Both were great. Fresh flavors, clean ingredients, lots of nutrients. I don’t believe a healthy life is one of perfect clean eating - it’s one in which I nourish myself well and indulge without guilt and with joy. And when in Italy, that means never saying no to gelato! Oh man, Edoardo is an absolute must! All of their gelato are free of chemicals, GMOs, or colorings. The milk comes from pasture-raised cows and the eggs come from free-range chickens. I mean, YES! I ordered the vegan Banana and the Fondente Assoluto (dark chocolate). I’ve had creamier banana flavors, but you can just TASTE how real this one is. And it was such a perfect pair to the rich and decadent chocolate. Two thumbs up for sure. 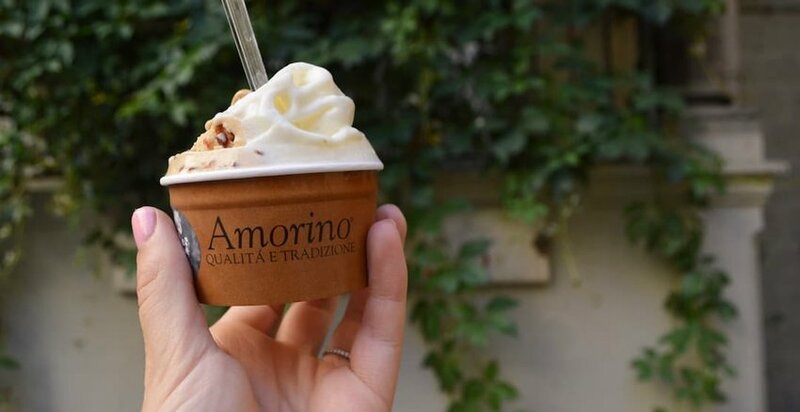 Amorino is a gelato chain that’s popped up in big cities across Europe and North America. Typically, that would turn me off. But my gosh it’s so darn good. Similar to Edorado, they take great pride in their ingredients. Every flavor also bears the name of where they source the main ingredient from. Ex: the Limone Femminello di Sorrento is made with lemons from the Amalfi coast. The Amarena is to die for. Just a little ways up from the Ponte Vecchio, Starbene is an entirely gluten-free bakery! They have some savory items, a whole shelf full of gluten free products, but mostly a couple cases of baked goods - cookies, cheesecakes, eclairs, and donuts. I tried this cute little cookie, and while I’d take gelato over this any day, it was still a fun option. Soak up all the art – The Uffizi, the Palazzo Pitti, Santa Croce. Just do it all. Enjoy an afternoon in the Boboli Gardens - Wander these gorgeous gardens for the best view of the city. Climb the Duomo – It’s worth the wait. Grab some gelato after dinner and enjoy it in Piazza della Signoria – If you’re lucky, an amazing old guitar player will serenade you and you might cry tears of joy at the beauty of the moment. Firenze really is such a special place and its food never disappoints. I’m usually a “grind hard, walk fast, see it all” kind of traveler, but Florence is a place that always reminds me to enjoy it slowly. If you’re heading to the Home of the David, get ready for some magic.